I live in a family that loves meat. My husband and two boys would be horrible vegetarians. They will put up with vegetables being in a dish or a meal or two during the week having no meat. However, anything more than that and I begin to hear complaints. When my husband is left to take care of my two boys they seem to eat a lot of bacon with chicken or pork as a side. Needless to say meat seems to always be center stage in my house. Sine meat is such an integral part of my family's diet I try to make sure we eat a large variety of protein sources and I switch up my menu plans so no one gets bored. Yesterday I tried a new recipe for Spiced Chicken with Creamy Horseradish Cabbage Slaw from the July 2012 issue of Woman's Day magazine. 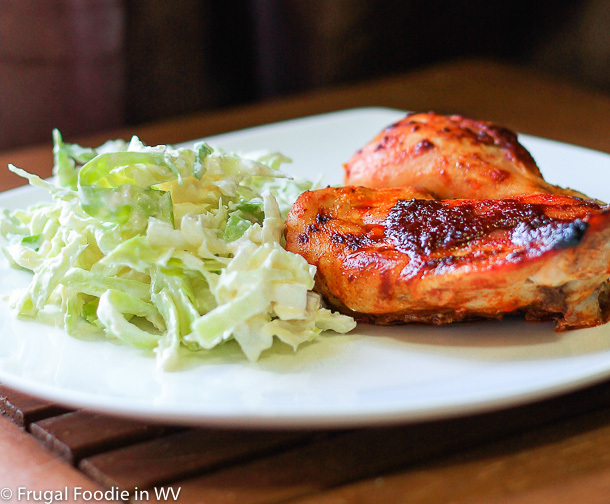 This recipe has 8 ingredients in the chicken and 9 ingredients in the slaw. It takes 1 hour 15 minutes of total time for the chicken, 20 minutes of which is active and 30 minutes of total time for the slaw, 15 minutes of which is active. Both recipes make 12 servings. The only change that I made to the chicken was to take the skin off of the thighs and I used honey instead of the brown sugar called for in the recipe. For the slaw I left out the carrot that was used in the original recipe. Instead of the granulated sugar I used agave syrup. I followed the remainder of the recipe as written. The slaw used in this recipe is delicious. My husband and two sons loved it and they are picky about slaw. The chicken was okay. It needed more flavor that it had from the rub. I would suggest adding 1 tsp of garlic powder and 1/8-1/4 of cayenne pepper to increase the flavor and add a little bit of kick. I think with the changes to the rub the chicken could be a lot better. The slaw would be delicious with a blue cheese burger or anything with blue cheese. The flavors would blend very well together. For the recipes go to Spiced Chicken and Creamy Horseradish and Cabbage Slaw. Ooooh, dinner with a little kick. I don't know if the kids would like this one, but it may be good for one of those "date nights at home" with the hubs. I'm lucky that my two boys like spicy food (for now they tend to like and unlike things super quickly :) I do put more spice in food though that is just for my husband and I. This sounds delicious. I love spicy foods but hubby isn't so keen about it. Thanks for sharing on Foodie friends Friday and remember to come back and vote on Sunday. I also love meat and would be horrible vegetarians. I do try vegan once in a while though. I'm a big chicken fan and this does look good! I was a vegetarian for year, but my sons and husband couldn't do it :) I love chicken also, yum! I would be a horrible vegetarian too, love my meats toooo much .. waaay too much if you ask me. That chicken looks delicious! Thanks :) Glad to know that other people would be horrible vegetarians! My husband and two boys are the same way :) Thanks for hosting!